The first time I got it loaded and outside, my sister shot me with a vaporizer while I was pumping, I was new to CPS so I though when I pulled the flash flood trigger on her it wouldn’t have much power. She was immediately soaked, she went inside shortly after. In reality though, someone with any water war experience would be able to get out of the way before the big blast hit them, for this reason I mostly use the small nozzle. The Flash Flood is a small CPS-based soaker, it has two nozzles, a 1/16" primary nozzle and a big ‘flash flood’ nozzle. It is well-balanced because of where the tank is mounted, however the pump handle is somewhat flimsy. I personally prefer only to use the big nozzle on a surprise attack from behind the opponent because it uses all the PCs water at once so you cant follow the opponent if they get out of the way. (not to mention you need to repump to fire again) The small nozzle didn’t have enough power in my opinion so I drilled it to 1/8". 1 2005 Original Equal Green body; blue detailing, chamber, reservoir; orange nozzles. 2 2006 Max-Infusion Equal Orange body and nozzles; blue detailing, chamber, reservoir. 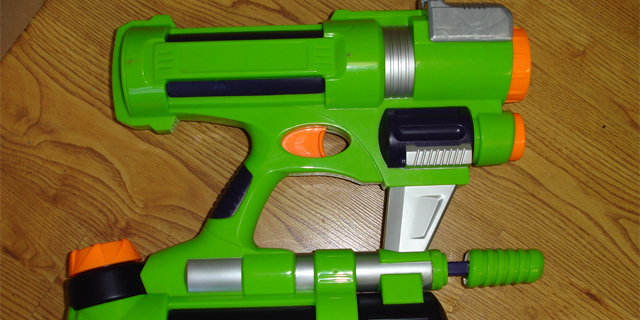 3 2006 Sharper Image Equal Silver body; blue reservoir and chamber; black riot-blast actuator; orange pump, trigger, nozzles, reservoir cap. 4 2006 Max-Infusion Twin Pack Equal Red body; blue detailing, chamber, reservoir; orange pump, trigger, nozzles; silver reservoir cap and riot-blast actuator. 5 2006 Max-Infusion Twin Pack Equal Blue body; green detailing, chamber, reservoir; orange pump, trigger, nozzles; black reservoir cap and riot-blast actuator.